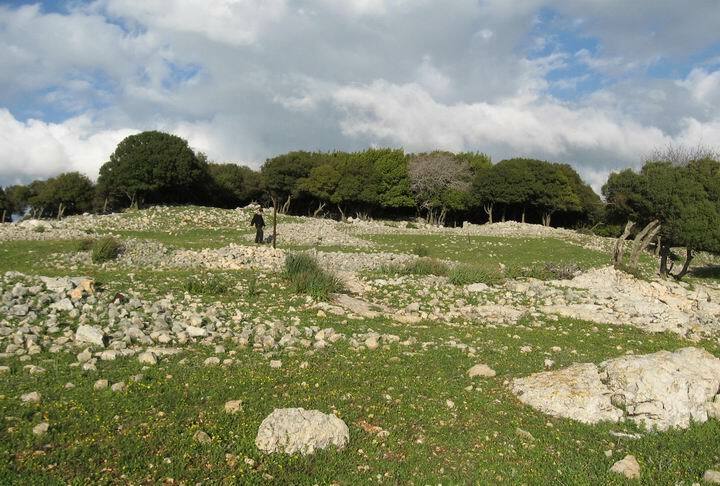 Khirbet Dubbah is the ruins of a Roman/Byzantine village, located on a hill on the south-eastern side of mount Carmel, north of Keren-Carmel (Mukhraka). Khirbet Dubbah is the ruins of a Roman/Byzantine village, located on a hill (475M) on the south-eastern side of mount Carmel, north of Keren-Carmel (Mukhraka). The site is located south-east to the outskirts of Dalyat-El-Carmel, one of the two large Druze villages on mount Carmel. A narrow and winding road from Dalyat-El-Carmel to the Mukhraka passes by the foothills of the site. For visitors to Mukhraka, we recommend a short hike from the parking lot at the bottom of the hill of the monastery to the top of the hill where Khirbet Dubbah is located. There is a tradition that this site was the place of prophet Elijah's contest with the Baal prophets, during King Ahab (9C BC). 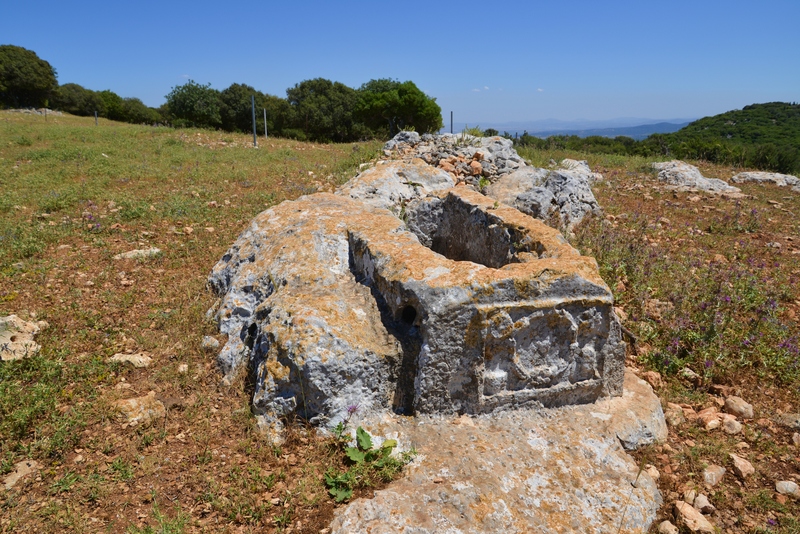 It is a second candidate to the Keren Carmel site (Mukhraka), located on the next hill to the south, where the Carmelites built a church commemorating his victory. The site was first populated in the Persian/Hellenistic period, one of the few sites (a mere dozen) on the top of the Carmel. During the late Roman and Byzantine period the number of sites on top of the Carmel/Menashe mountains increased to 100, and the whole area prospered. There were 4 villages within a close (1KM) radius to Khirbet Dubbah: Keren-Carmel (on the adjacent south hill), Khirbet Kerach (north-west to the site), Khirbet Addah (north to the site) and Khirbet Netzurah (south to the site). At a 5KM radius there were more than a dozen Roman/Byzantine sites. These villages were mainly small agriculture villages, although each village had additional crafts and small industries, such as stone cutting in Khirbet Oren and in Khirbet Dubbah (the unfinished sarcophagi found on top of the hill was probably was a stone coffin commissioned by Beit Shearim catacombs). The village also produced glassware, since the site is scattered with many remains. During the Arab period all these sites were eliminated. Later, during the Crusaders period (10th-13thC), the site was one of the 3 remaining sites on top of the Carmel, and called Digegia. It continued also during the Mamlukes (14th-16thC), one of the dozen sites at these times. Today the site is in ruins, and partially covered by bush. The site is located on a hill, seen in this aerial view on the left side. A road from Dalyat-El-Carmel passes to the south of the hill, in direction to the Mukhraka, which is seen here on the right. In the far background is the valley of Yizreel (Jezreel). Another view from the west side shows a closer view of the top of the hill. The ruins of the ancient village are scattered on the top and the north and east slopes. This is the ground level view of the site from the south side, and easy climb from the road towards the Mukhraka. The ruins of the houses are seen in the photo below. Some of the ruins reach 2-3M. Between the buildings, and mostly under them, are cisterns that used for storage and water reservoirs. One of such holes are seen in the center. Another view of the west side of the village. There is another section of the village on the eastern slopes, facing Yizreel valley and the Kishon brook, which has a great panorama. On top of the hill, on the side facing Keren-Carmel, there is a large stone that was cut out in the quarry located on this side. The stone was probably a stone coffin that was intended to be shipped to the catacombs in Beit Shearim. It is almost finished, decorated by a wreath on the side as seen in the photo below. It was reused for agriculture, maybe for wine making, since there is a drainage hole on the far corner. Mukhraka - Arabic: the fire. It is based on the fire from God that lit up the altar, showing that God is the true and only God. As per 1 Kings 18: 38: "Then the fire of the LORD fell, and consumed the burnt sacrifice, and the wood, and the stones, and the dust, and licked up the water that was in the trench". Khirbet - Ruined site in Arabic; Khurvah in Hebrew. Dubah (Dubbah) - Arabic: cattle. This may be the source of the name.